A large building forms the first service area in Cornwall, but the facilities are somewhat limited by traditional standards. First two hours free for all vehicles, after which all vehicles must pay £15 per 24 hour period. Prices are paid in the restaurant. The former Little Chef advert on the exterior of the building which was still on display several years after the closure of the Little Chef. This is a large service area set into the hill by the A38 bypass of Saltash, built by Granada in the 1980s. Like Warminster, the bypass is partially single carriageway and the services have never really warranted the large grounds they occupy; its construction was more about achieving maximum network coverage quickly. The Travelodge reception area was moved into the main services in 2001, following several extensions to the motel. 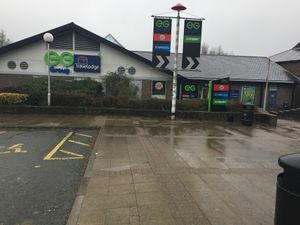 On the other side of the roundabout there is a Texaco filling station with a Spar shop, called Tamar Services, but it is not signed, causing some confusion as it is closer to the A38 than the signposted Saltash services. There is also a Waitrose supermarket opposite. Car boot sales used to be held here regularly. A farm used to be accessed through the services. Granada wanted to erect a large Celtic Cross at the back of the services, with a sign on the A38 inviting traffic to stop and visit it. They were told they could have the cross (without the sign) for two years only, as the Highways Agency wanted the land for a road improvement. Neither the cross nor the road improvement ever happened. The restaurants here are operated by Euro Garages whilst Moto own and operate the petrol station and lease out the motel. There is a children's nursery which shares the same site. This was originally a tourist information building, which was fenced off in 2001. There had been plans to turn it into a drive thru Burger King since 1995, and in 1999 there was a plan to replace it with a larger restaurant. A Coffee Tempo! outlet was here for a time situated within the main foyer of the building. When this closed, the area was left empty with only a window remaining as a clue to its existence. This area is likely to have been a small retail shop and an old game arcade previous to this. The Little Chef closed in early 2012 and became part of a Burger King only set-up along with four other sites. The former Little Chef area was replaced with a Subway in 2014. During summer 2018, Euro Garages refurbished the site, including the Burger King and Subway. Greggs was added at the same time, making it the first branch of Greggs to open in Cornwall (although it is operated under a franchise agreement). This addition prompted fury from local residents. Euro Garages moved the main seating and restaurant area, creating a more open-plan food court. 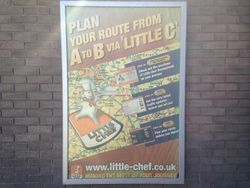 An old Little Chef advert was still displayed on the exterior wall of the main amenity building here for quite a while, just to the left of the entrance, promoting ways to find Little Chef locations online despite the Little Chef having been closed since 2012.